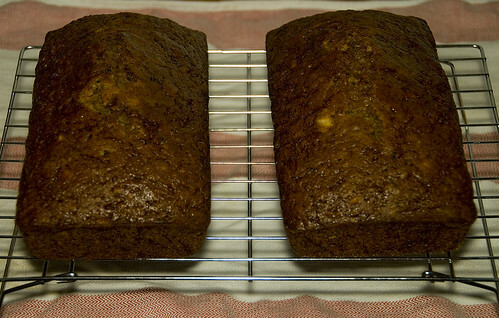 atara emailed from from work and said, "I demand zucchini bread!" Who am I to ignore such a demand. We were beginning to wonder if we would get any zucchinis from our garden this year - I don't know if it is a combination of the heat and humidity, or a blight of some sort, but they have been rotting on the vines before they can develop. We had two literally explode out of nowhere though, going from being too small to eat to being too large for much other than baking literally overnight. I shredded up one of them to make these two loaves. Apparently Zucchini will freeze well if you shred it - no blanching required - so I may shred enough for another set of loaves from the other one and stuff it into the freezer so that we can make zucchini bread in the middle of the winter. This recipe is remarkably easy; I think I can probably remember it off the top of my head. Mix it all together in a bowl and then pour it into a couple of greased bread pans. Bake it for 60ish minutes at 350F, remove upright from pan to a cooling rack and take pictures. Don't forget the last step, it's very important if you want to get in your picture quota for the day. If one wanted to add a bit of flavour and richness I imagine one could substitute butter for the oil, brown sugar for the white sugar, and double up on the Vanilla and Cinnamon. I may play a bit with the next loaves I make. A lot of recipes also call for you to ruin it with nuts and raisins. Good zucchini bread does not need nuts and raisins.